The Club was originally set up in 2002 by a small team of enthusiasts who provided the initial impetus and a lot of effort to get the Club up and going. We have evolved considerably and today we have Members from all over the world. 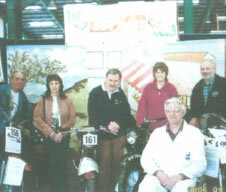 The Inaugural meeting of the club was held on 14 April 2002 at the National Motorcycle Museum Birmingham. The initial committee consisted of Chairman, Editor, Treasurer, Secretary, Membership Secretary and Events Coordinator. A Publicity Officer was proposed, this was combined with the Editor role. The first Club magazine (the Banter) was published in May 2002; the magazine was constructed, edited, printed and distributed by the Chairman who continued to do this until 2007 when the membership had grown to over five hundred. After that it was decided that we should outsource it to a professional printers and that is how the Banter is produced today. 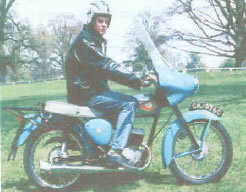 The first show we attended was the VMCC Founders Day on the 28 July 2002; we had just one Bantam on the stand. The Committee was reshaped and consisted of Chairman, Treasurer, Membership Secretary and Secretary. The first ‘Getting to know you’ meeting was organised and combined with the AGM. The aim was to kick start the events programme and member participation. According to the minutes of the AGM there were then 155 members. At the AGM in June 2004, the committee was extended to include the re-introduction of a Show and Events Secretary, a Technical Officer and Membership Secretary. The membership was then 280. The Club shop started! The AGM in August 2005 was held at Coventry Transport Museum. The first Dating Officer, authorised by the DVLA, was appointed. To help with the dating process the Club acquired a complete copy (on microfiche) of all the Bantams ever built. These records were originally provided by the Science Museum. The records do not give the registration numbers but show the frame number, original engine number, the date when it left the factory and who it was sold to. Initially the Dating Officer and Technical Officer duties were performed by one committee member. The first year we had a stand at the Stafford show in April. Membership was 322. The AGM was held in June at the Museum of Road Transport in Coventry. The dating Officer and Technical Officer roles were separated and a dedicated Technical Officer was appointed. The number of shows and events we attended increased significantly as did the membership which was 370. The AGM was held at the M&C Motorcycle Museum, Bakewell. A new Bantam Editor was appointed and the Banter started production from a professional printers. The AGM was held at the Kidderminster Railway Museum in May 2008, committee roles were increased to include an Advertising Officer and Web Master. Barry Cook took on the job of Chairman and in his summing up he said “The committee is dedicated to providing a Club that members want to be a part of. Our aim is to give the Club a local feel irrespective of where the members live, with a national network to back it up as required. Providing services like technical help and a facility for dating Bantams with approved certification from the DVLA should always be an integral part of what we do. 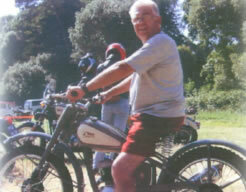 The Club maintains close contact with the media and has gained the reputation for being very active in the vintage motorcycle fraternity. The Club magazine has gained a reputation for quality and content and is a welcome sight when it drops through the member’s letter box – especially to those members who are rebuilding a Bantam! It is our aim that by providing a regular stand at the various large events nationwide we can encourage our members to meet each other. By 2011 the Club had around 900 members and continues to grow. It has a very active local area reps scheme and is represented at a number of major shows each year as well as organising its own Bantam focused events. Current Membership ……… over 1400.